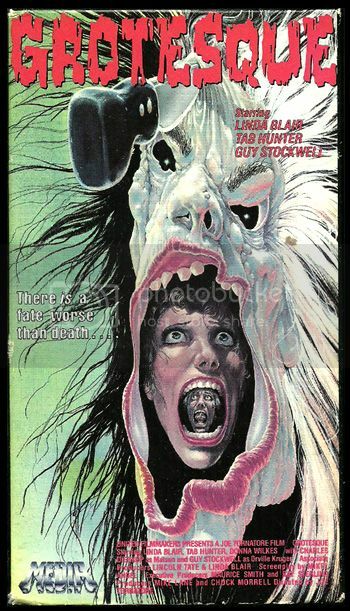 While I'm doing all this VHS tape slingin' on eBay, I have been thinking about the VHS tapes whose covers were, for one reason or another, just so terrifying that I never could muster up the courage to rent. Some of these are pretty obvious but others might need a bit of explaining. This is pretty obvious. Yeah, I didn't see Blood Feast until I was in my 20s. I had completely forgotten about Grotesque until the DVD came out recently. 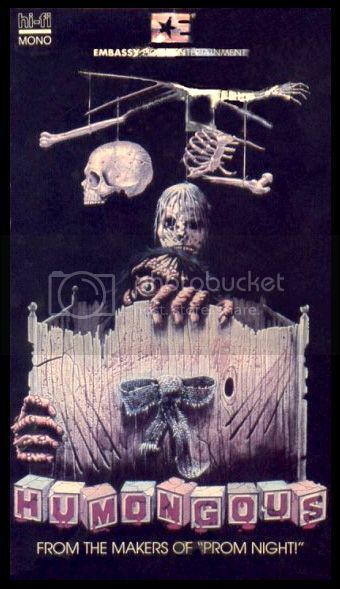 This is such gorgeous artwork though it does look more like a horror fiction book cover than a VHS. All I know for sure is that my youthful fright came back very strong. I kept my distance from this tape. 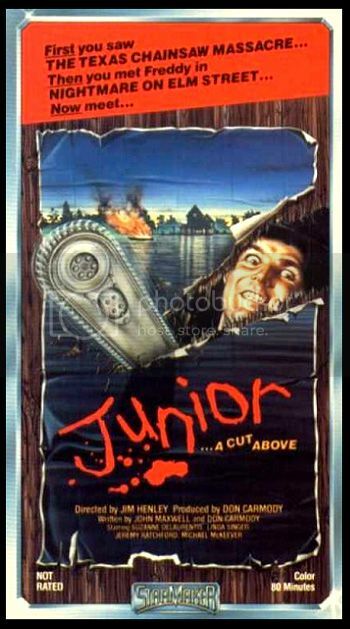 I was scared of Junior and I never rented it. The reason being that I imagined that the wood that the chainsaw is cutting through was flesh. Why? I don't know. I just did. The thought of all that carnage (which probably isn't in the film) just made me feel queasy. These two effective covers, one for Scared Stiff and one for Humongous and they are both pretty obvious as to why they were too much for me. Scary faces! 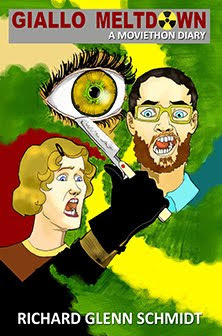 I think Humongous is more brilliant because it hides what is likely something very much like the image on Scared Stiff. 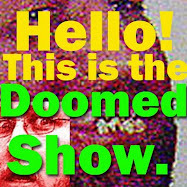 After I saw both Jaws and Jaws 2 on television, it was over for me and shark films. O-V-E-R. 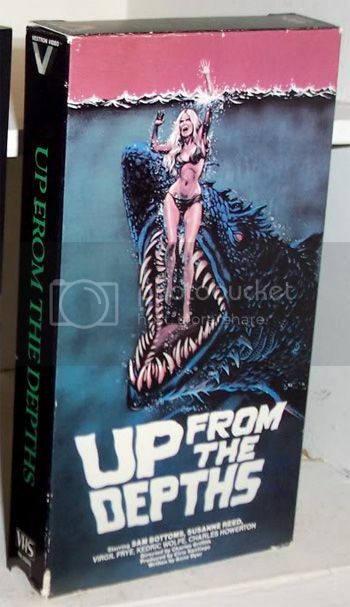 The artwork for this cover for Up From the Depths was obviously inspired by the burned face of the shark in Jaws 2. 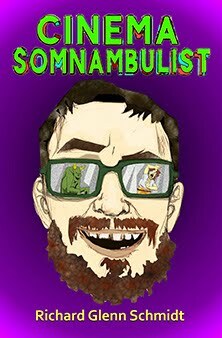 Seriously though, this is one crunked up undersea beast! That was more than enough for me and I never watched this film. 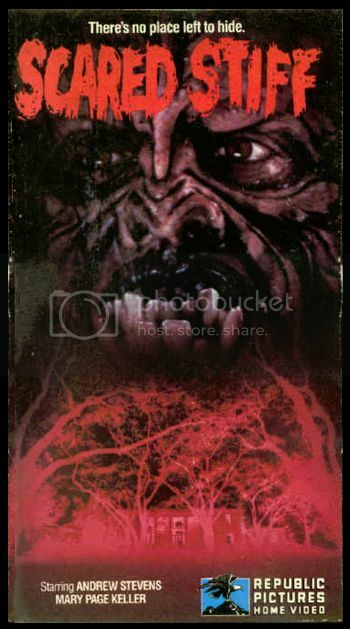 More VHS covers of doom! It's making me think of all the ones that loomed down on me from the shelves back in those innocent, starry-eyed video shop days. The two that freaked me out the most were maybe the cover art for The Gate and The Blob (1988)--though it didn't stop me from renting both repeatedly. Another I couldn't get over was Return of the Living Dead 3. Seemed pretty clearly not my thing as an 8-year-old. The weirdest one to unnerve me was Psycho III. I thought Anthony Perkins's wild-eyed expression and eager dangling of that keyring were utterly deranged. In retrospect, I must have been easily unnerved.